Almost everybody is susceptible to motion sickness given the right (or wrong) conditions. It seems intuitive to say that a person who suffers motion sickness on the sea or in a vehicle will be more likely to get motion sickness on an aircraft. However, this is not the case. Motion sickness caused by one mode of travel does not predict motion sickness caused by another mode of travel. How Common is Motion Sickness in pilots? I remember clearly my first flight in a light aircraft which was a trial introductory flight with the aim of embarking on PPL training. I experienced significant motion sickness. My instructor said after the flight that motion sickness is common in new pilots and would probably settle down. I was a little sceptical to be honest. However, he was right – the motion sickness rapidly went away – and didn’t come back. Another example is the budding sailor who gets severe motion sickness and staggers off a yacht after 4 days of initial training – only to never get motion sickness again. Research has shown that around a third of student pilots experience motion sickness. The good news is that research also demonstrates that motion sickness in student pilots usually settles down. The bottom line for student pilots is this – persevere and the problem will likely go away for reasons that will be explained. Motion sickness in passengers is common in light to medium sized aircraft. This goes without saying though motion sickness is by no means universal. What are the risk factors for motion sickness? Motion sickness usually settles down with repeated exposure to the same mode of travel. The reason is that the brain (in a neurological way) “remembers” the previous neural mismatches (episodes of motion sickness or vertigo) so that future episodes of neural mismatch are compared with past experiences..
Why Does Motion Sickness tend to settle with time? Motion sickness usually settles down with repeated exposure to the same mode of travel. The reason is that the brain (in a neurological way) “remembers” the previous neural mismatches (episodes of motion sickness or vertigo) so that future episodes of neural mismatch are compared with past experiences. Incidentally, the fact that motion sickness tends to settle with repeated exposure forms the basis of one of the treatments that is used in military flying: Desensitisation – which means just that. The pilot is subjected to increasing intensities of stimuli (The Corolis effect) that provoke motion sickness in the Centrifugal Chamber. There may be further training in the simulator. 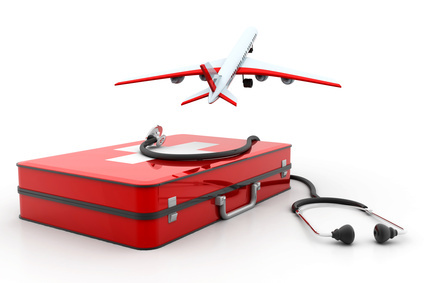 What can help before the flight? What should someone affected by motion sickness “do” at the time? It’s important to state that there is no single best way to act. There is quite a lot of individual variation to different strategies. Keep the eyes focused on the distant horizon¹ ². This is easier for pilots than passengers! Keep the head as still as possible – reduce any head movement. Avoid talking about motion sickness, and maintain a positive attitude³. For passengers, listen to music and practice mindfulness. Pilots are already focusing on flying the plane. However, situational awareness requires “relaxed concentration” which in itself may reduce symptoms of motion sickness. May keep the eyes closed – this works for some people. What are the treatments for motion sickness? Kwells® (Hyoscine Bromide tablet – available over the counter as 0.3mg tablets). Usual dose for adults is 0.6mg taken an hour before. The tablet lasts around 6 hours. Side effects include drowsiness and dry mouth – but also include dizziness and visual disturbance. Hyoscine also comes as a 24 hour patch (scopolamine) though this is not available in Australia. Promethazine – better known as Phenergan or Avomine. Sedation more likely than with kwells. Pseudoephedrine: This is best known as a decongestant and acts as a stimulant, reducing the drowsiness caused by Hyoscine. The combination of Hyoscine and Pseudoephedrine is a traditional cocktail that has been used in Coastguards. None of the treatments are recommended for pilots because of sedative and other side effects. 2: Griffin MJ, Newman MM. Visual field effects on motion sickness in cars. Aviat Space Environ Med. 2004; 75(9):739-748. 3: ANDREW BRAINARD, MD, MPH, and CHIP GRESHAM, MD, Middlemore Hospital, Auckland, New Zealand; Prevention and treatment of motion sickness. AFP 1st July 2014.